Heads up on our Black Friday Weekend Deal! 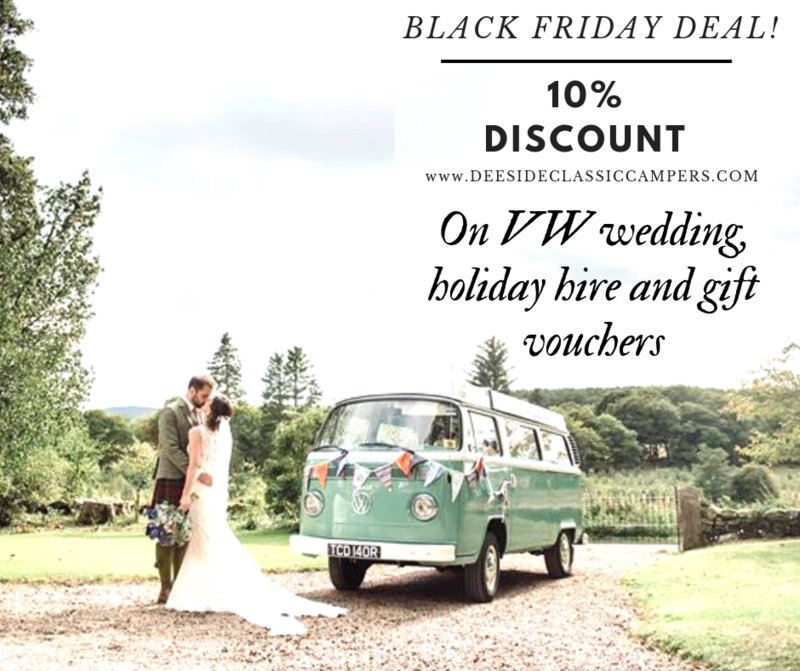 (Friday 23 November to midnight Sunday 25 November 2018) receive 10% discount on wedding or holiday campervan hire or GIFT CARD/VOUCHER! (bookings taken within this period). PLUS a FREE AWNING with any holiday hire booked. 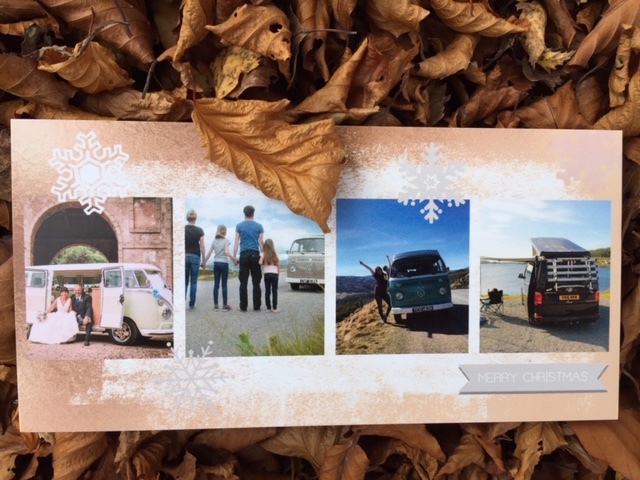 What a great gift for campervan fans! It makes the perfect Christmas, birthday, anniversary, thank you, or special wedding present! The recipient can start planning their adventure straight away! We can help with the planning of their adventure with planning a route and recommending some fantastic campsites (discounted sites available from the Camping & Caravanning Club! 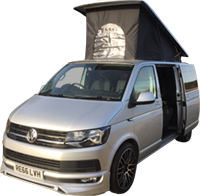 )… see our Blog posts of 10 Reasons Why You Should Hire a Campervan and A Beginner’s Guide to a Classic VW Campervan Adventure. Put that day-dreaming about fish & chips enjoyed in the campervan, watching the waves by the sea on the Isles of Lewis, Harris or Mull, by that peaceful pebble beach by a loch, or seeing the birds of prey gliding above the Scottish Cairngorms into reality …. pure bliss! There are two options for our Gift Voucher/Gift Card; We can organise a Gift Card for you for a particular camper or hire period. 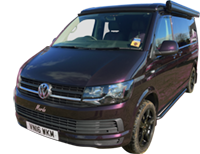 Or you can just pay a set amount (which will appear on the Gift Card) and the recipient can choose their favourite campervan and when they want to go on holiday. 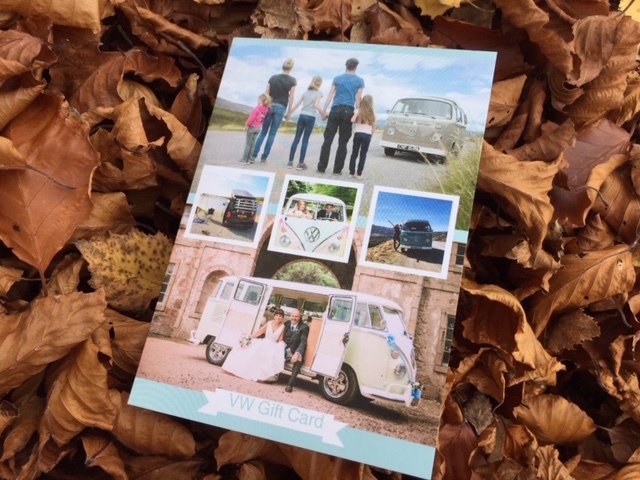 Available for any amount over £50, the Gift Card is valid for one year from the date of purchase and can be used for any hire period, in any one of our VW campers. We can then pop the Gift Card in the post to you or send it directly to the recipient. Your Gift Card can be posted out on the day that they are ordered. Last minute Gift Cards can also be emailed, so don’t panic if you have left it too late! Let us know whether you would like our CHRISTMAS or CLASSIC Gift Card. We do ask that you keep our VW boys within Scotland. Please do give me a call at the office on 01330 850555 or email Claire on office@deesideclassiccampers.com if you would like to discuss your Gift Card! Alternatively, just go to Contact Us/Frequently Asked Questions page and get in touch that way. We look forward to welcoming you and your friends!